The State Coverage Initiatives (SCI) program hosted an all day meeting for state officials earlier this week to discuss the technical and policy issues related to All-Payer Claims Databases (APCDs). 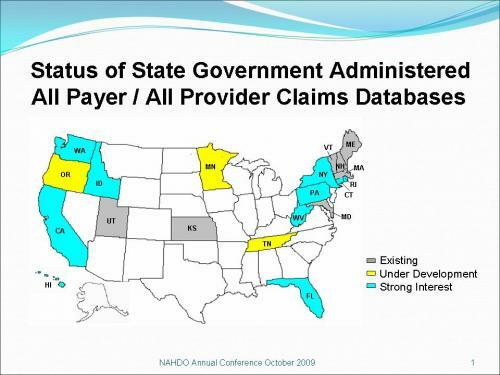 The meeting was co-hosted with the National Association of Health Data Organizations (NAHDO). The slides from the meeting can be found here. As you can see from the figure below, seven states already have state-administered APCDs, and they are being seriously considered in several more. States are using these databases to promote greater transparency in health care prices and quality, as a tool for payment reform, to manage overall health care spending (by both public and private payers), and assess population health. The meeting served as a way for states with existing APCDs to share ideas for funding, governance, and use of the information, and for new states to benefit from the experience of those who have already resolved many of the technical issues involved in setting up an APCD. Email us at sci@academyhealth.org for more information about setting up an APCD in your state.